Blondies *Do* Have More Fun! Ok, so maybe that is not completely true. After all, my hair is a (ahem) natural mahogany brown color. 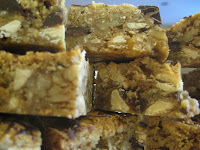 But in the world of sweets, blondies can certainly be lots of fun! Ever since then, I've kept my eye out for blondies. Unfortunately, they just don't appear as often as their chocolate cousins. So what's a girl to do? I had to take matters into my own hands. I started searching. 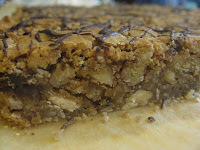 I had ideas as to what I wanted in my blondie: It needed nuts. It needed white chocolate. It didn't need toffee. I needed a basic understanding of what makes a blondie. I needed recipes that showed me ratios so I could add my ingredients and my flair to it. I went to all my favorite baking sites and cookbooks, gathered some ideas, and fashioned a masterpiece of oatmeal goodness, browned butter nuttiness, and chocolatey yumminess. 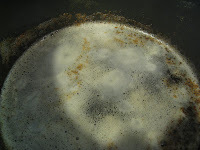 Add butter to a small saucepan over medium low heat. We're browning butter now, so let it go beyond the melting stage. You want to see the little bubbles around the edge of the pan get all nice and brown. Your nose will help tell you when the butter is browned--you'll start to sense a nutty-caramel-like smell. Delish! Remove pan from heat. 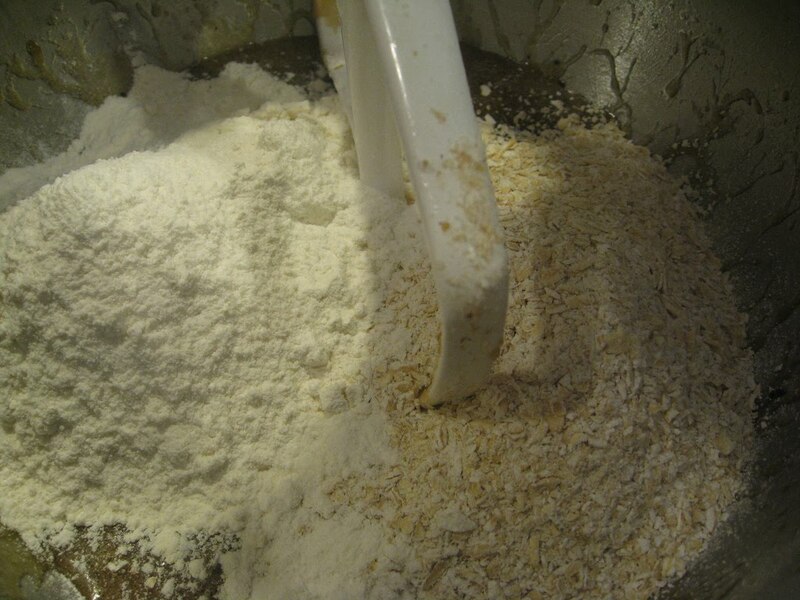 Add oatmeal to a food process and process until it becomes a powdery, flour-like substance; set aside. Chop nuts by hand and set aside. 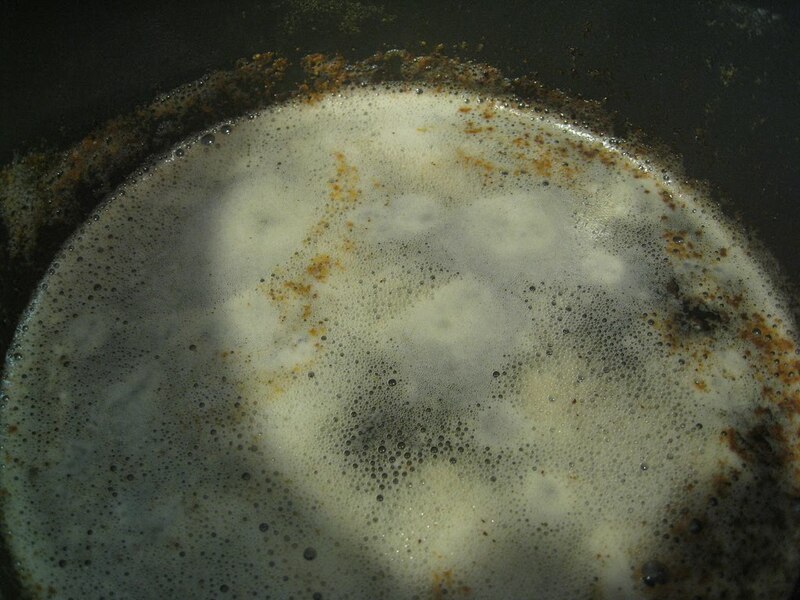 Combine brown sugar, browned butter and salt in mixer. Mix on medium speed for about 5 minutes, or until the mixtures is no longer grainy. Add eggs and vanilla (or Amaretto) and mix on medium speed until well combined. 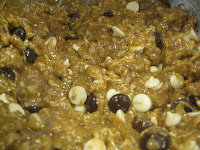 Add flour and oatmeal, and mix on low speed until just combined--be careful not to over mix. Line a 9 by 13 baking dish with parchment paper. (Note: You could just butter the dish, but the parchment paper will make it uber-easy to remove the blondies and buys you lots of removal insurance.) Evenly spread batter in dish and bake for 20 to 25 minutes. It's totally ok for it to be a bit soft to the touch in the center. 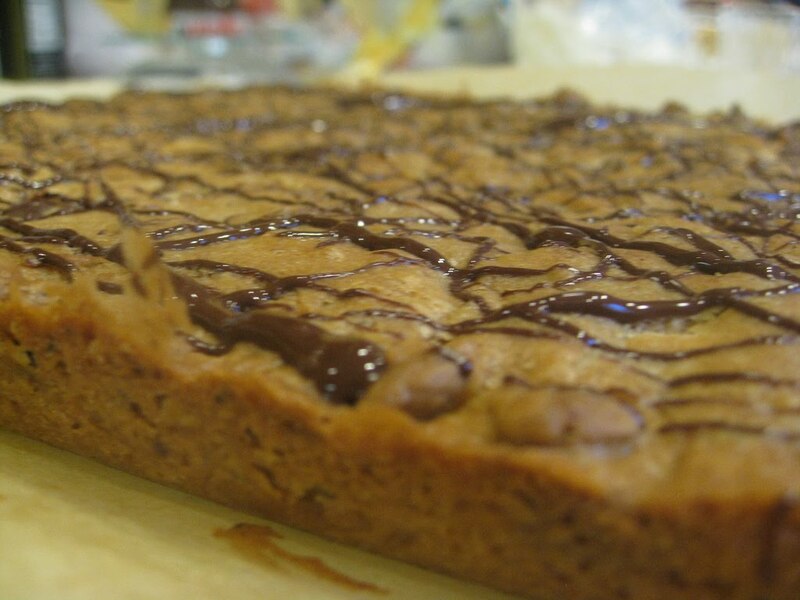 Let the blondies cool in the baking dish on a rack. 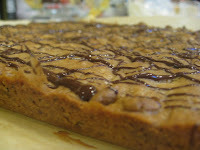 Using the parchment paper as handles, remove the luscious blondies from their baking vessel and place on cutting board. Over a double boiler, melt the remaining 2 tablespoons of dark chocolate. Using a spoon, drizzle the dark chocolate over the top of the blondies. Place in refrigerator for about 2 hours to finish cooling. (After it sets, it will be easier to cut.) Depending on your crowd, you can make your blondies large squares of heaven or petite bite-sized morsels of love. Either way, grab yourself a cold glass of milk and enjoy! Ok, I'll gush. I married the most amazing man. I knew he was a keeper when I came out to visit him. For our first dinner date, he took me for Mexican food. What can I say? I fell head over heels for its spicy-cheesy-gooey foods. 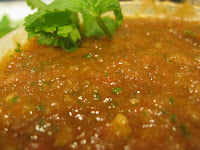 The salsa was smooth, rich, thick and had a lovely kick to it. So the next night, when he asked where I wanted to go, I said Mexican. And on the third night, I said Mexican. On the fourth night? Yep, I asked for some more Mexican. Each night he smiled and happily took me back to the same Mexican joint. That was the beginning of a beautiful relationship. (Both with Mexican food and my husband-to-be!) Over the years, we frequented our fav place, even making the trek back when we moved out of the area. We always ordered extra food so we had leftovers, and always filled the to-go containers with lots of salsa. Of course, the place spoiled us. Even eating chips and salsa at home was... disappointing. The bottled stuff, no matter how fancy the label and regardless of their authenticity claims, never seemed to hit the spot. Until one day, I was served a close facsimile. I insisted on the recipe. As I often do, I messed around with the recipe, adjusting ingredients to my flavor preferences. 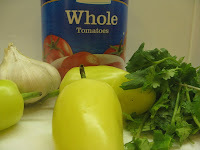 Love the garlic, don't need the onion, want a fresher flavor, like it slightly chunky and *lots* of heat.... And then I hit the jackpot balance of flavor and heat. 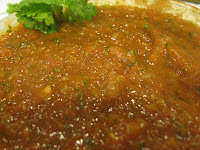 I can't even imagine ever buying salsa again, and I think my salsa is just as good (or even better) than the stuff served at our ol' haunt. Blend for about a minute or two (depends on your blender) until smooth. Like it really chunky? Run the blender with the garlic, cilantro and salt. Then add tomatoes and peppers and pulse a few times. *Got kids? Like the flavor of salsa but not so much the heat? Try the Bambino version below. My kids can't get enough of it! 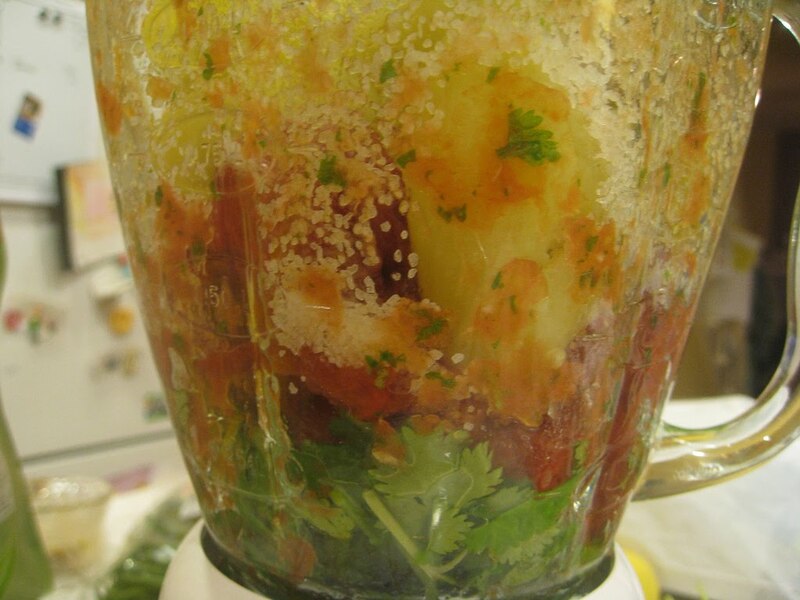 Put garlic, cilantro and salt in blender. 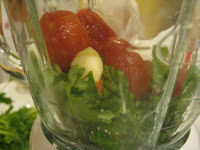 Drain tomatoes of excess liquid and add to blender. Blend/pulse to desired thickness. Enjoy with chips, on tacos and with all your favorite Mexican snacks! Muy Bueno!